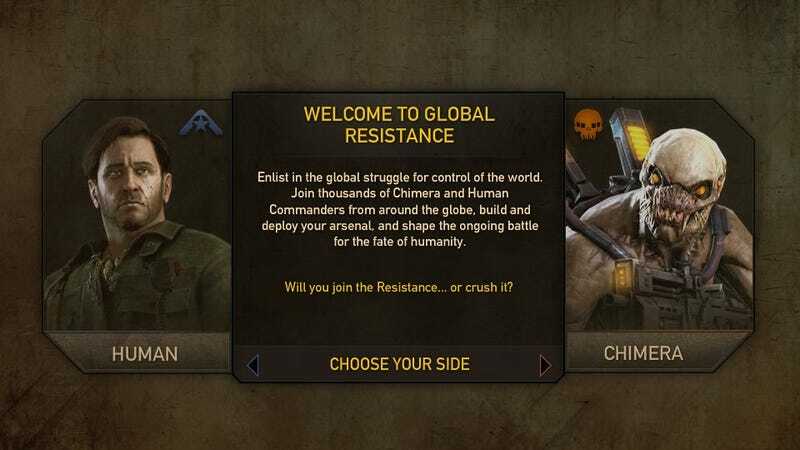 Insomniac Games has launched the beta for a web-based strategy game called Global Resistance, described as a "massive strategy game," featuring all players battling on the same global map in a game offering crossover features with the upcoming console title. In a trailer shown at Resistance's Comic-Con 2011 panel, the conflict between humans and Chimera resembles table-top strategy games like Risk and Axis & Allies. Insomniac creative director Marcus Smith cited Risk as an inspiration. Players will progress in rank and experience, fortifying their base and, it appears, building out a character for special player-vs-player conflicts. Gameplay in Global Resistance will earn players unlockables, multiplayer skins and other premiums. In addition to linking to players' PlayStation Network accounts, it can also link to their Facebook accounts for social purposes. "The massiveness of it is on the map. When you're fighting skirmishes on the map, youre fighting with thousands and thousands of people," Smith said. Smith said a beta for the game should launch tomorrow, being available through the game's official site, myresistance.net. Smith said Insomniac is still tinkering with the length of matches, leaning toward a multiple-week length. "We want it to be an important event." On another note, Insomniac noted that the multiplayer beta for Resistance 3 will be the first week of August, and will feature two modes: Team Deathmatch and Chain Reaction.